Parisian architect Patrick Nadeau is currently constructing a gorgeous green house disguised as a grassy hill in the city of Reims, France. Spotted over on Dezeen, La Maison-Vague or the “Wave House” is clearly for plant lovers, as the contoured roof is dedicated to our leafy friends. Its unique take on green roof design is testament to the every-expanding array of green building options that are available — we love how the home’s rolling roof infuses landscape architecture with building design. Mr. Nadeau is constructing the home now and plans to complete it by late 2011. Another unique design feature is how the home’s perimeter is raised a couple of feet (half a meter) to act as a perimeter bench. The façade is constructed of double-skin polycarbonate glass — the same material used in greenhouses. The architect describes the vegetation as “a mix of grasses, leafy succulents, thymes, lavenders and other small aromatic and perennial plants distributed in relationship to the inclination of the hull structure.” If you have been paying attention to green building you probably know by now how impressive green roofs can be at providing insulation — especially keeping a building cool during the summer months through evapotranspiration. A custom water misting system will be incorporated and used “only if extremely necessary.” Magnifique vert! Such a good article I'm having research and developement about wood projects, and I got in here and learn a lot of information about my field of interest. Thank you. Funny how this house seems like a blatant rip-off of the Eco-Arch house in Kent which is already built and in existence.. 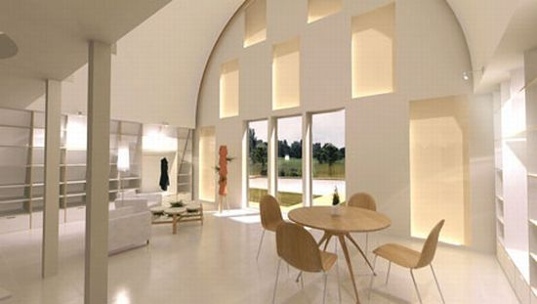 It was designed as a "passive house" and the University of Cambridge are running tests on the house's ability to be energy positive. Check out Grand Designs for a complete run-down on the ORIGINAL arch house conception, design and construction. This Parisian has as much imagination as every other Plagiarist in the universe. Pathetic. Sweet Lord, is that ugly!!! The only consolation is that it's only a model and will never thankfully be realized. 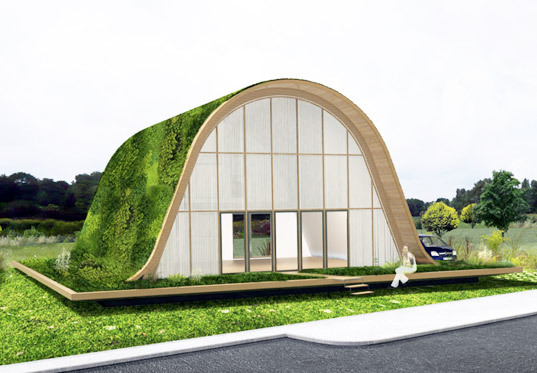 Parisian architect Patrick Nadeau is currently constructing a gorgeous green house disguised as a grassy hill in the city of Reims, France. Spotted over on Dezeen, La Maison-Vague or the "Wave House" is clearly for plant lovers, as the contoured roof is dedicated to our leafy friends. Its unique take on green roof design is testament to the every-expanding array of green building options that are available -- we love how the home's rolling roof infuses landscape architecture with building design. Mr. Nadeau is constructing the home now and plans to complete it by late 2011.